A few days ago I finished this quilt and it is already on its way to my customer in Germany. This was fun and I love how the quilt came together. 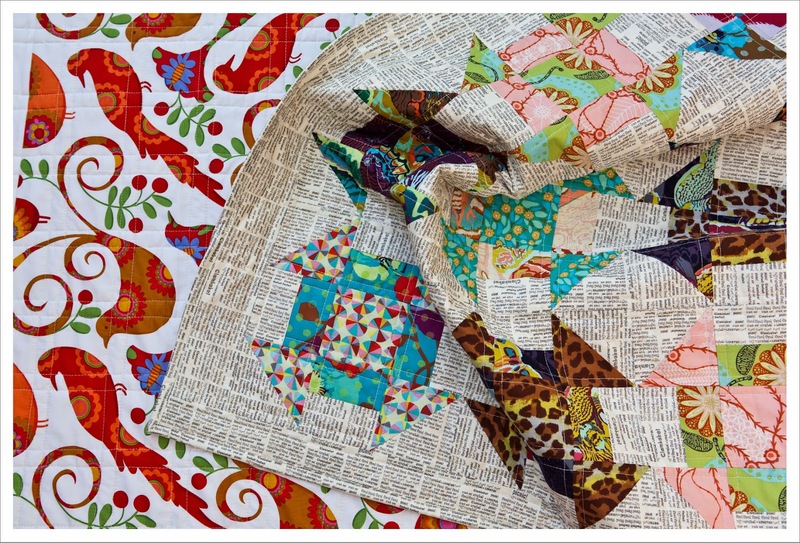 There were a few design considerations because initially I thought to use the text fabric for the inside of the blocks until I realized that it would have made the quilt way to busy. 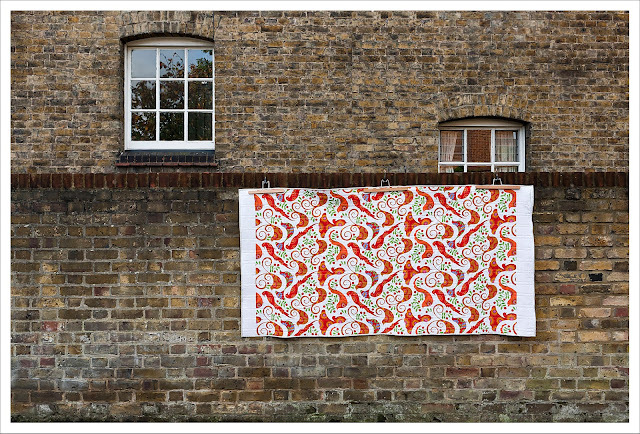 This is a single quilt (2m x 1m) which is an usual size for me and not that easy to photograph as I don't have walls around me that are over two 2 meter high and on which I could hang the quilt. I quilted in double lines along the seams of each square to achieve a nice cross hatch. I think this quilt would have benefited also from in-the-ditch quilting as the front is fairly busy and it would have achieved a single crosshatch on the back too. The back is 'Pretty Bird' in spice from the 'Pretty Bird by Pillow and Maxfield Spice Group' collection for Michael Miller (here). I don't think this print is available anymore. I used it once before as a quilt back and love how striking it is. The churn dash blocks were arrange so that a darker and a lighter block are placed consecutively and from each fabric combination I made four blocks but with interchanging fill of the half square triangles and rectangles. This stops the quilt from being to riotous in its colour combinations. 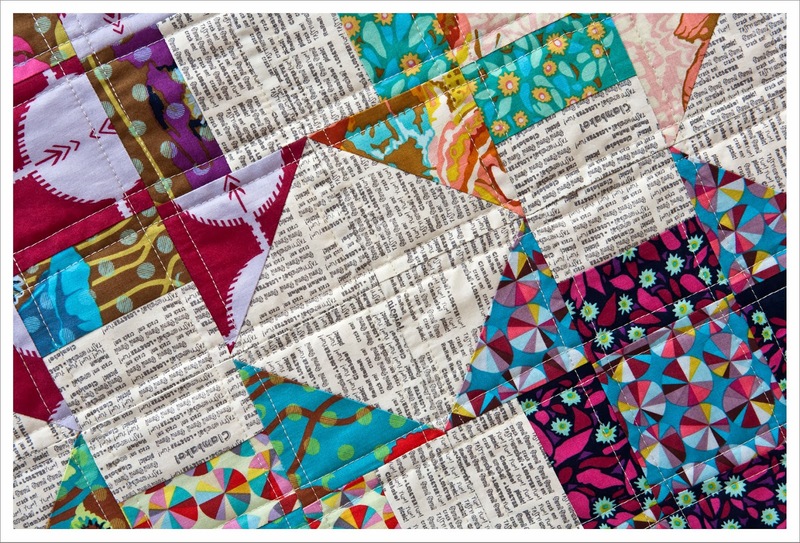 This is such a great block and I love that the half square triangles give it a spiky look. This should make for a great quilt class too in the new year. It's beautiful but I agree an odd size. I love churn dashes and your colours and placement work so well with the text background. A beautiful quilt! This is perfect. The fabrics looks so great against the texty background. 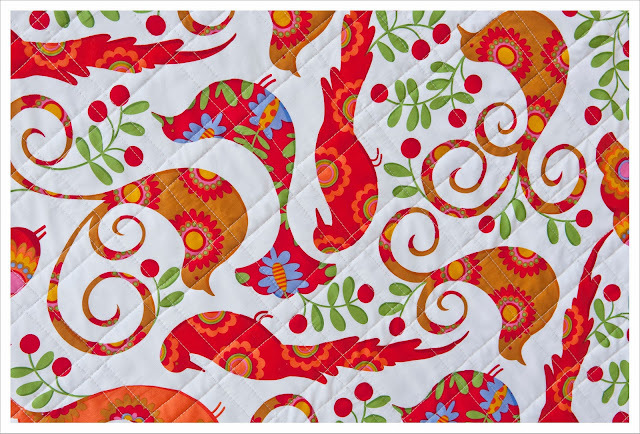 SUCH a fabulous quilt. I love the texture it has and that background--superb!